Long Island Restaurant Week is in full swing! So far I have been to two restaurants this week and am planning on visiting at least one more before Restaurant Week concludes. On Wednesday night I ate at Bliss in East Setauket, New York. I had driven past this restaurant numerous times when in the Three Village area, but I’ve never stopped in for dinner. The restaurant is nestled next to The Curry Club on Route 25A and is near other shops. Parking is ample. Bliss has a cozy feel and adequate seating. Their Restaurant Week menu looked good but was nothing out of the ordinary. I was looking forward to ordering the calamari as an appetizer and the hangar steak for my entrée (which had an additional $5 charge). The calamari was prepared slightly differently, in a roasted garlic cream sauce instead of an oil base. I found the sauce a bit overwhelming and would have preferred it served more traditionally. I ordered my steak medium rare, and it came with a side of bacon and cheddar mashed potatoes. The mashed potatoes were delicious and I liked the flavor and crunch from the bacon. The steak was good, but a little tough. For dessert I had a choice of cheesecake, tiramisu, or chocolate mousse. I ordered the mousse, which came in a glass and was topped with whipped cream. 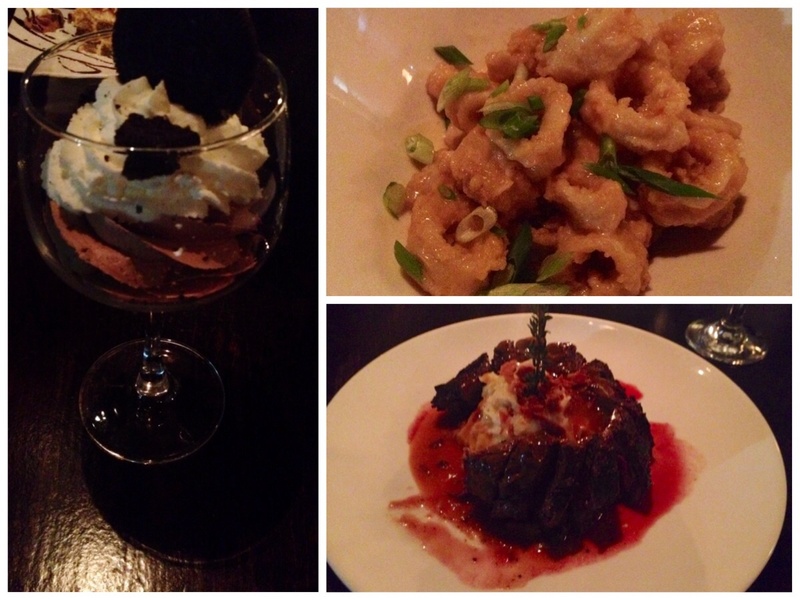 Overall, I am glad that I gave Bliss a try during Restaurant Week. The service was very good and I enjoyed my meal for the most part.